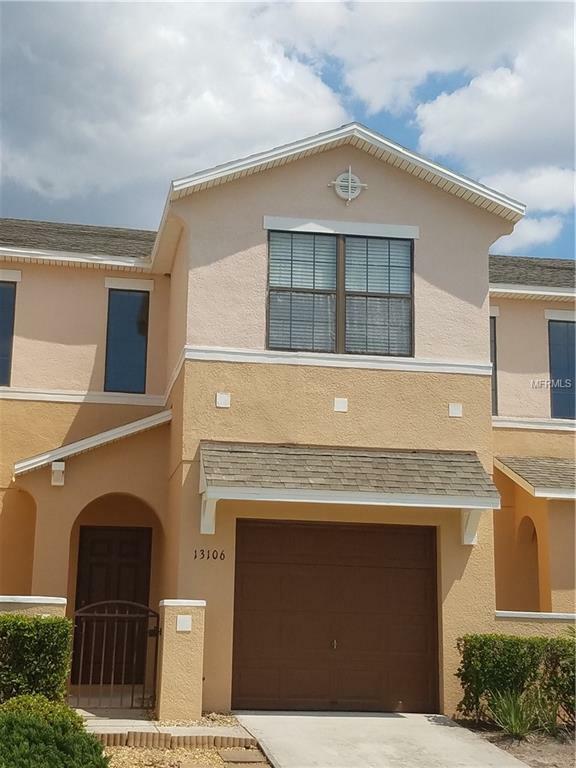 Come see this move in ready 3 bedroom, 2 1/2 bath, 1 car garage home in gated Tuscany Bay. This home is located one mile from I-75, and just minutes to the new St Joseph's Hospital, Tampa Bay, and the new YMCA. Plus it's a short commute to Downtown Tampa, Brandon, Sarasota, and St. Pete. This home offers designer touches that you'll notice as soon as you enter including a front courtyard area, a cathedral style foyer, and a rounded staircase. The downstairs has an open floorplan with the kitchen, great room, and dining room combined. Upstairs you'll find the master bedroom with adjoining master bath, two secondary bedrooms, a second full bath, and separate laundry room. This home also includes a covered screened lanai that backs to conservation. You can relax in your private backyard or take advantage of the brand new community pool that's currently under construction. Tuscany Bay homeowners enjoy a maintenance free lifestyle with low HOA fees and no CDD fees.